Dry 201 Message Pub » New Order Related » Ceremony » Peter Hook & The Light - USA/Canada 2018. 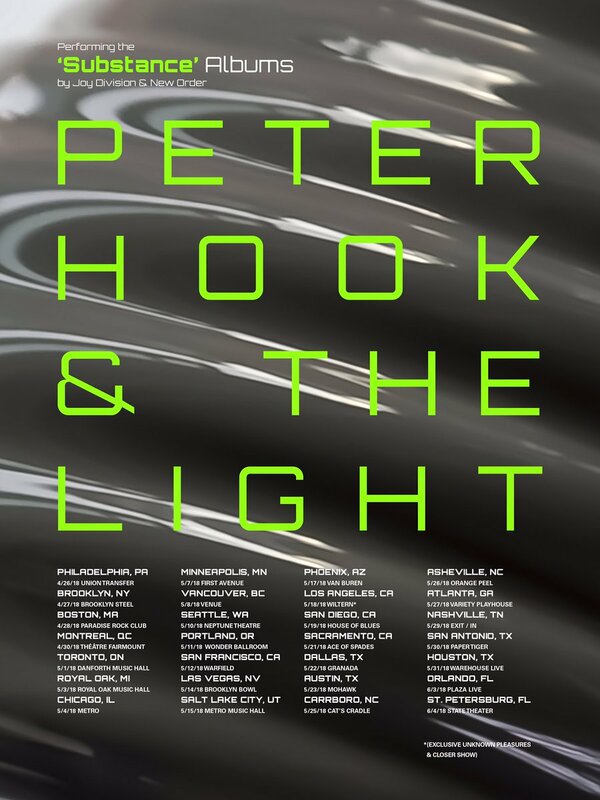 Peter Hook & The Light - USA/Canada 2018. Thank your old man for me I bumped into him at the Manchester Townhouse the other weekend when I was at the MIF and he was a true gent, allowing photos and a quick chat. 2 users thanked Mark for this useful post. 3 users thanked Jack for this useful post. Next year offers many opportunities to see them . I hope for an outdoor show. (orlando)?? I would not mind if the bunnymen tagged along . We are playing in Orlando on the tour at Plaza Live on June 3rd but it is not outdoor. There is a free outdoor show in West Palm Beach on June 2nd that is not a Substance show but more of a 'best of' set. That is outdoor. I've been looking for an excuse to go back to Las Vegas, if tickets are still available I think I will go then. It its to soon to plan a trip to Vegas, maybe after Christmas. Also there are more then 3 cities in Canada. Try Alberta. There are 2 cities with over a million people per city. Just 3 hours from each other. Calgary and Edmonton. Just saying. We tried to come to both those cities, none of the promoters there were into it. Just saying! Thanks for trying. It's true we have always had trouble getting good acts to come. I did see Hooky DJ here. It was a cold winter night, but I will take what I could get. I guess I will see you in Vegas! Booked my flight and hotel and got my tickets. There is much to do in Vegas, and I will kick it off with seeing Jack and Hooky. Substance Rules! I live in Asheville. So, naturally, I got very excited when I saw this. That particular poster lists Asheville as one of the tour stops. Yet the poster on The Light's Facebook no longer includes it... Some sites (including the venues') don't list the show, while other commonly used ticket-sites claim to have tickets available. Does anyone know if this particular show was cancelled? I hope it wasn't, as I'd love to see them! 1 user thanked VanGelder for this useful post. You tried twitter? Both Hooky and Jack are pretty good at responding to questions about gigs on there. I can't believe this is STILL a month away. It went on sale so long ago i've forgotten about it multiple times. The last time in St. Pete was a great show. I wonder if we'll get a "last show of the tour" surprise?